As every man knows, it is impossible to win an argument with a woman - even when you are right. I pulled into the Convenient Mart to get milk. When I walked toward the store I noticed these two cops watching a woman who was smoking while fueling up. I saw her and thought, "what an idiot... with the cops right there too." But anyway, I went in and got my milk. As I was checking out I hear someone screaming. As I was walking outside I saw the woman's arm was on fire! She was swinging her arm and running around going crazy! I ran outside to help but the cops had already put her on the ground and were putting the fire out. When they put handcuffs on her and were about to put her in the police car, I was thinking "She shouldn't have been smoking and pumping gas!" Being the concerned citizen that I am, I asked them what they were arresting her for, figuring that catching her arm ablaze would be punishment enough. The police officer looked me dead in my eye and said ... 'Waving a Firearm in Public'. Hurricane force winds in the North Atlantic churn up some monster waves and even from the relative security of an oil platform the oceans power is impressive. . In the 14th Century alone, the Black Death is estimated to have killed 200 million people. That's roughly the population of Brazil. 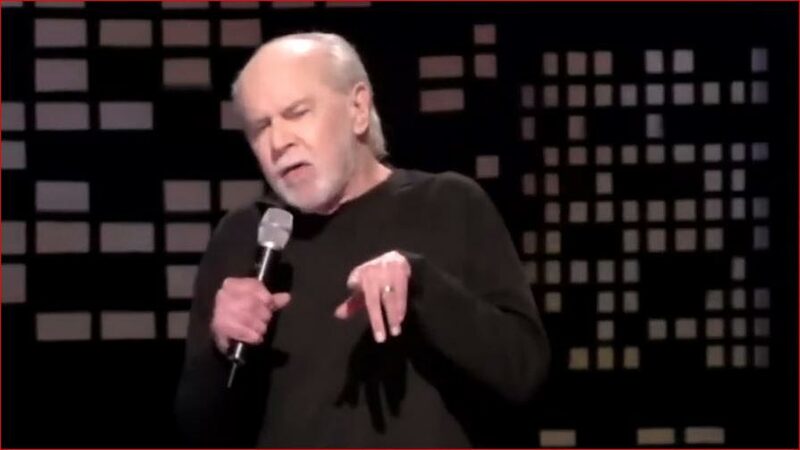 It's hard to imagine humor and suicide going together, but George Carlin pulls it off in a humorous comedy monologue about suicide. Why is Washington called the District of "Columbia"? Because its namesake, Christopher Columbus, didn’t know where he was going, didn’t know where he was when he got there, and he did it all on borrowed money! The music plays, a young girl in a bikini dances, then Granny comes along and shows her up. This comedian has a unique style of comedy that some would call humorous rambling tales, and in this performance he begins with some crazy stories about Greek Gods. The humorous rope trick from comedian and magician Mac King is his signature sketch. Watch closely and try to figure out how he manages to keep cutting the rope and still have only one piece of rope. A bus station is where a bus stops. A train station is where a train stops. I have a work station. An intimate and hypnotizing look at aquatic life through beautiful time-lapses at a magnified perspective. This up-close look brings you into the world of corals, sea stars, and other marine creatures that seem almost otherworldly. .
An Irish priest named Father O'Malley was transferred to Texas. Father O'Malley rose from his bed one morning. It was a fine spring day in his new west Texas mission parish. He walked to the window to look out on the beautiful day and noticed there was a dead jackass lying in his front lawn. He promptly called the local police station. The conversation went like this: "Good morning. This is Sergeant Jones. How might I help you?" "And the best of the day te yerself. This is Father O'Malley at St. Ann 's Catholic Church. Sergeant Jones, recognizing the foreign accent, thought he would have a little fun with the good father, replied, "Well now Father, it was always my impression that you people took care of the last rites!" Father O'Malley then replied: "Aye, 'tis certainly true; but we're also obliged to notify the next of kin first, which is the reason for me call to you." How do "Magic Mushrooms" chemically alter your brain? What causes the user to experience a sensory overload of saturated colors and patterns?. Handyman extraordinaire, Red Green shows you how to make your very own Airstream travel trailer using nothing more than used appliances, an old boat trailer, and lots of duct tape. A boy got a Saturday job bagging groceries at a supermarket. One day, the store put in a machine for squeezing oranges. The boy asked if he could work on the machine. "Sorry," said his boss, "baggers can't be juicers." The Sagan Series is an educational project working in hopes of promoting scientific literacy in the general population. Excerpts from the pale blue dot combined with current video in this the ninth of the Sagan series. Guys are naturally a little awkward when hot women. It is doubly awkward when that hot woman is your sister . When his grandmother telephoned to ask how he was a nurse said 'No change yet'. I went for a walk last night and my kids asked me how long I'd be gone. Jane couldn't find anyone to sing with, ...so she went out and bought a duet yourself kit.